My family and I love to go to the local Chinese buffet. It’s a Sunday afternoon, after-church tradition now. We’ve been doing it for over seven years! You’d think we’d get tired of the same old, same old, but this particular restaurant switches up their menu just enough to keep things interesting. Our favorite things (the sushi, the coconut shrimp, the fried dumplings, etc.) are almost always there, but every once in a while they introduce something new to the spread. Like yesterday, when they had these strange-looking little round things sitting out at the dessert table. I figured it much be some sort of fruit, but I didn’t have a clue what it was. Still, I’m an adventurous type, especially when it comes to food, so I thought I would try it. Our server came by the table before I’d taken a bite, and I asked her what they were. “Lychee,” she said, pronouncing it “lee-chee,” or at least that was the way it sounded to me. She smiled at me like she didn’t really believe she was having to tell me what it was. What could I say? I was a lychee virgin. I’d heard of the fruit before, but I’d never seen it in person, so I’d certainly never tasted it. I speared one little fruit with my fork and cautiously stuck it in my mouth. Immediately, I tasted the ginger, and I wondered it if that was part of the fruit’s natural taste, but some later research online told me that probably wasn’t the case. They’d probably added ginger to it when they baked it. My first overall impression? It was quite different from anything I’d ever had before, although the texture was somewhat reminiscent of baked pears, I thought. And it was spicy! But that was okay by me because I happen to like spicy food. When I got home, I hit the Internet looking for more information about lychees. Turns out, by not knowing anything about this fruit I was really missing out! 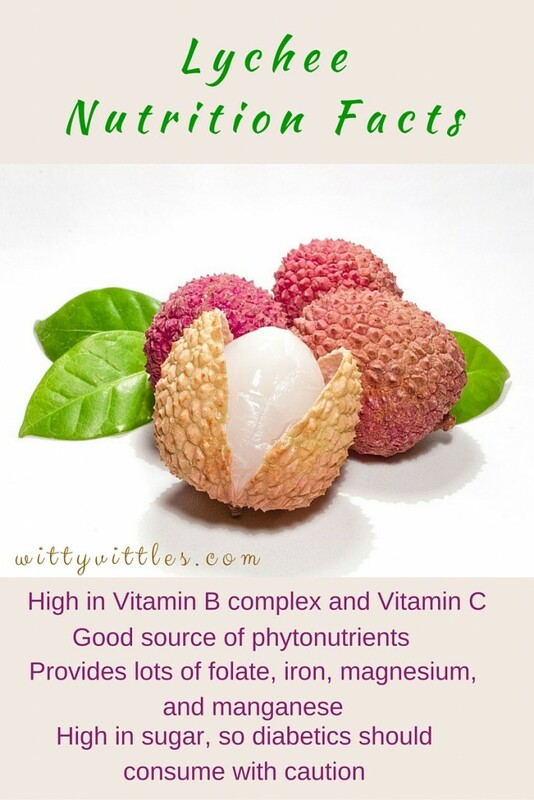 Lychees are amazingly nutritious! Please note, however, that lychees are really high in sugar, which may prove problematic for some diabetics, so consume with caution – and ALWAYS in moderation. During my Internet search, I even found a yummy baked lychee recipe to try at home. So, I made my husband go out and find some lychees (which was no easy feat in Louisville, KY), tweaked the recipe by adding some things, and baked my lychees in the microwave (like I bake everything else). Spray a Pyrex baking pan with Pam cooking spray. In a small microwaveable bowl, melt the butter. Add the brown sugar, cinnamon, and ginger to the butter, and stir together thoroughly. Roll each lychee in the sugar mixture, and set on the baking dish. Pour remaining sugar mixture over the lychees. Put the dish in the microwave and cook on medium power for about three to five minutes, until sugar is caramelized. Serve immediately, and refrigerate any leftovers. If you haven’t yet tried lychees, I highly suggest giving them a try. They’re a really different taste sensation at first, but in a delicious way – especially baked. Try this out, and see for yourself! Previous What’s So Bad About Junk Food? Never tried them before, but I have heard the name many times. I like spicy, so this would probably taste good at the end of a meal! Hmm…there were canned lychees at Aldi’s in the clearance cart this weekend but we weren’t curious enough to try them. So much nutrition in such a beautiful little fruit! Pinning and stumbling! I didn’t know anything about the lychee! Thanks so much for sharing with the Let’s Get Real party.